QuNeo vs Akai MPD32 – iDallas! ← Raspberry-Pi Plus MS-20 Controller, Holy Cool Batman! QuNeo was the first Kickstarter project I ever funded and I just got mine in the mail a couple of weeks ago. I’ve only had a few hours to spend with it, but that’s been enough to get a feel for what it’s capable of and what it will do for my setup. I play live laptop/keyboards/synths/drum machine in a rock-tronic band called Thrillouette in San Francisco. The setup is primarily Ableton Live on a laptop with some midi controllers plugged into it for live control. The controllers include a Softstep from Keith McMillen, the people who make the QuNeo, as well as an Akai MPD32. The QuNeo is expected to replace the MPD32 so I’m going to do a quick comparison of the two. The first thing I noticed when I unpacked the QuNeo is that it’s quite small. It’s way smaller than the MPD32, which is actually pretty big with generous spacing between all the controls. That makes it very easy to get used to but I’ve always thought it could be smaller. The QuNeo is closer in size to a Novation Launchpad, which is a clear competitor to it. I like to keep my setup compact so this is a big win for me. The QuNeo uses a very complex programming system for it’s various presets so it’s hugely powerful and capable of a wide variety of interactions with MIDI software if you put some time into it. Ableton Live is also very flexible if you put in the time to program your own control surface definition for it in Python. Fortunately, the QuNeo people have included a nice set of presets including a couple aimed directly at use with Ableton Live. There were some quirks with getting up and going with it but after restarting the software a couple of times it ironed itself out. The biggest difference between using an Akai MPD32 with Live and a QuNeo is the QuNeo acts as a full two-way control surface and it changes to reflect what’s going on in Live itself. The MPD32 is only a one-way MIDI controller (though a quite capable one), and that limitation has always bugged me about it. That alone is enough to make me want to practice with the QuNeo until I feel very comfortable with it. The MPD32 is set up within Live as a control surface but it’s functionality just doesn’t extend as far as I’d like. I’ve customized my setup in Live to make it work for me, but I’ve always felt like I had to adapt to it rather than the other way around. Another great thing about the QuNeo is the fact that the 4×4 grid of pads can detect taps on each corner so it can also act like an 8×8 grid Launchpad-style. In a single controller it’s both a clip launcher and a drum pad trigger. Very cool! Unfortunately, it’s going to take me some practice to get used to the amount of pressure needed to successfully trigger the corners. It takes more pressure than I expected with the default setup so it’s not something I feel comfortable using live right out of the box. It’s going to take some time. To act like a control surface, the QuNeo uses a crapload of multi-colored LEDs under the various touch surfaces. It’s a clever system but the virtual touch faders don’t have nearly the responsiveness of real faders like the MPD32 has. The real knobs on the MPD32 are also very nice to use. I rely on those real controls for my live performance now so that’s going to take some getting used to. Having 8 physical faders right in front of me as a mixer for my various parts is great for me. The QuNeo had to make obvious trade-offs for physical size and flexibility and I think it’s worth it, but I will miss it. For some types of controllerists, the MPD32 will be a much better choice. The MPD32 also gives you 4 banks of the pads with very quick switching between them (just a dedicated button push) and I have gotten used to that. I’ll probably end up customizing the presets on the QuNeo to get that same sort of behavior. That’s easy, but it’s tedious. Overall, for the size and price I think the QuNeo is unbeatable for controlling Ableton Live with such tight integration. It’s more physical of controls than a fully touchscreen system, but it still gives you a lot of the flexibility of one. I think they were trying to design a controller that would give you the best of both worlds and they’ve definitely gotten the closest yet that I’ve seen. The QuNeo is the new toy so I’m obviously enthusiastic about it but it’s not a clear choice over an MPD. The MPD32 has almost no learning curve and has nicely spaced and well labeled controls. The QuNeo has a steep learning curve and no labeling at all. If you put in the time (which could be considerable), you’ll be able to do more with a QuNeo than you can ever do with an MPD32. Akai’s MPD line is targeted very much at people who want a quick MPC like interface for their music software and I think it does quite a nice job at that. It’s a very flexible MIDI controller with an intuitive layout. How do you find the pad sensitivity differs between the two? @Ryan In my limited time with the QuNeo I think I prefer my MPD32 pads. For how I use my pads in my live setup I think the QuNeo will work fine once I get used to them. I’ve spent a lot more time with my MPD pads. Also, I did have to open up my MPD32 and add some electrical tape to make the pads more sensitive like you can see in this video: http://www.youtube.com/watch?v=hZViS288WH4 Before I did that the pads were not sensitive enough. @robert The QuNeo is the new toy so I’m obviously enthusiastic about it. It’s not a clear choice, though. The MPD32 has almost no learning curve and has nicely spaced and well labeled controls. The QuNeo has a steep learning curve and no labeling at all. If you put in the time (which could be considerable), you’ll be able to do more with a QuNeo than you can ever do with an MPD32. 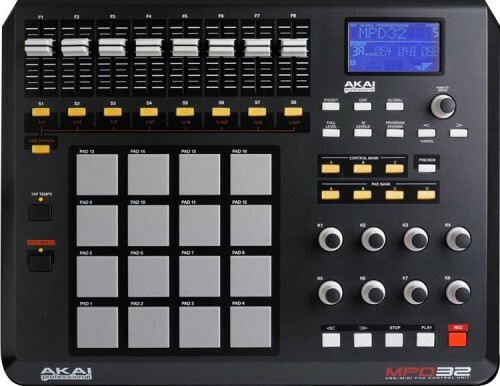 Akai’s MPD line are targeted very much at people who want an MPC like interface for their music software and I think it does quite a nice job at that. i own both the quneo and the mpd24. nice review. one thing worth mentioning as well is the feel of the pads. The Quneo has hard, plasticky feeling pads that your finger can run smoothly across. The MPD has rubber pads which have more friction. Personally I prefer the feel of the MPD. However the Quneo is so far above the mpd in pad sensitivity and functionality. The touch faders on the quneo require you to press hard. The faders on the Akai are decent. 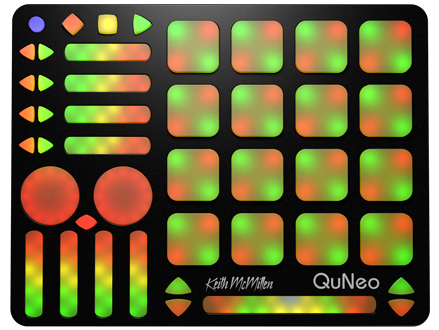 I personally would use the quneo + an ipad or maybe some other controller which has faders/knobs. The portability of the quneo is also outstanding if you make music with a laptop. MPD is not really portable. @eonomine I did know about changing the pad sensitivity on the QuNeo but didn’t mention it. Thanks for bringing it up! That’s a great feature. I had to add electrical tape to the inside of my MPD32 pads so it wasn’t great out of the box for me. I have spent almost all of my time with the QuNeo so far (only a couple of hours total) working with the Ableton Live clip triggering preset so far and haven’t used it to trigger drums for more than a few minutes. Without changing the sensitivity I got the feeling it was usable for me, but I didn’t explore it enough to know more than that. I’ll have to try out the Akai emulation mode and see how it works for me. Thanks!